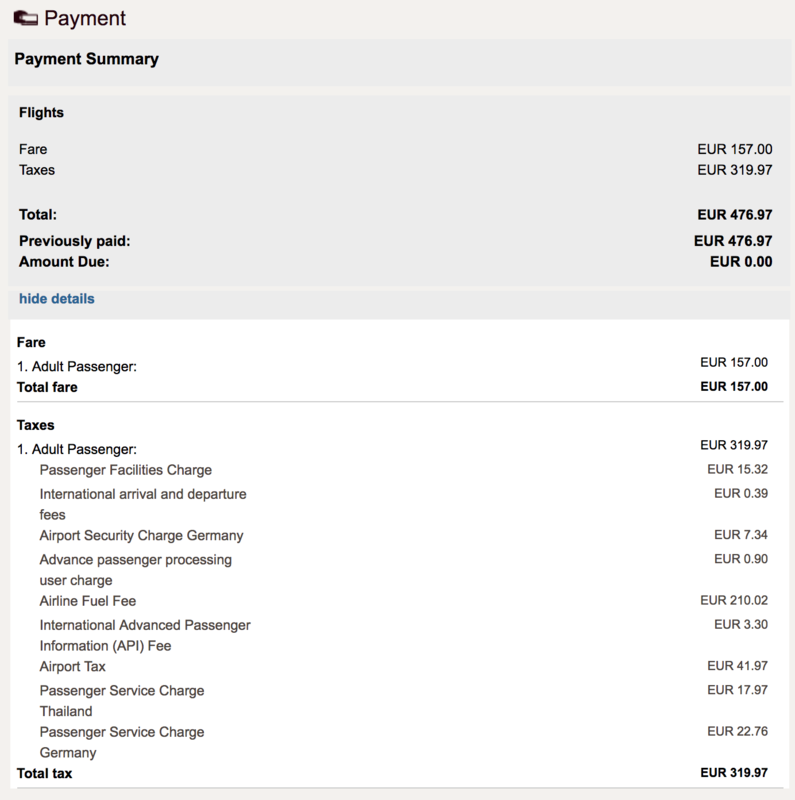 The price of my flight is shown in the picture below. I want to understand the airline fuel fee better. Is it still legal to call it an "airline fuel fee"? Why is the airline fuel fee considered a tax? It came to my attention that the fare price compared to the amount of taxes is unreasonably high. But the biggest chunk of taxes is one thing that isn't a tax anyway. The airline fuel fee. I've read that the fee came from the high oil price era. The time is over and since it's not allowed to call it like that anymore, I think some airlines simply changed the name without changing the charge itself. Is it just a sloppy mistake to still use the name or is it still okay to do so? If the fuel fee is just a label to distribute the costs on another point, why is it allowed to call a tax? Again is it just a sloppy way to write it down? All other costs in taxes are not taxes per se, but at least costs the airline has to pay and is not allowed to keep. Still the fuel fee is different. The intention of this question is not to complain but to understand. Service providers like to deceive their customers by either showing them a lower price up until the person commits to the deal (currently illegal in the EU and in many other countries) or by pretending as if their own profits are actually smaller than they really are - Airbnb is one good example as they only show you half of the fee they end up charging. In your particular case the airline does its dirty trick by using a 'fuel surcharge' which dramatically lowers the perceived amount earned by the company. "What goes into that [fee] for customers doesn't really matter because the competition happens at the cost-of-the-ticket level," Freed added. "It's really a non-issue for customers because there's various competition on what a ticket costs to go anywhere." in most cases the language has been changed to “taxes and surcharges” or “taxes and fees” to better reflect these various components. Some sites / channels may not have been updated. Not the answer you're looking for? Browse other questions tagged air-travel legal price fees-and-charges or ask your own question. Why did my flights make unscheduled fuel stops?